Nov. 14, 2016, 6 a.m.
By Joseph Lichterman @ylichterman Nov. 14, 2016, 6 a.m. 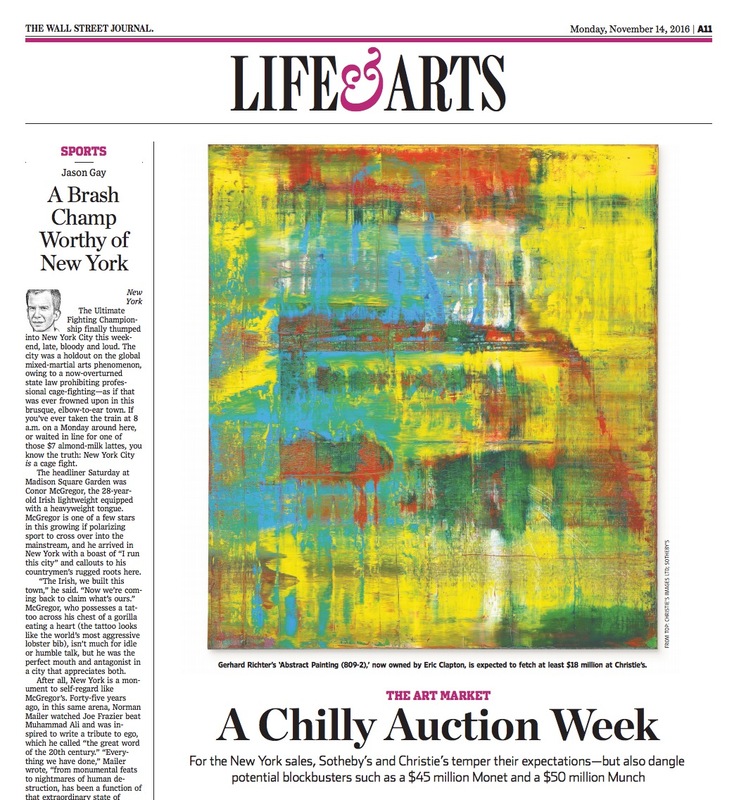 If you’re a Wall Street Journal print subscriber, you might notice that Monday morning’s paper looked a bit different. As part of an effort to cut costs in response to plummeting ad revenue, the Journal debuted today a reformatted print edition that eliminates and combines some sections. The Journal is introducing a “Business & Finance” section that combines its previously separate Business & Tech and Money & Investing sections. It’s also folded the Personal Journal and Arena sections into a Life & Arts pages that will be included in the A section. The Journal also eliminated its standalone Greater New York section, folding that into the A section as well. 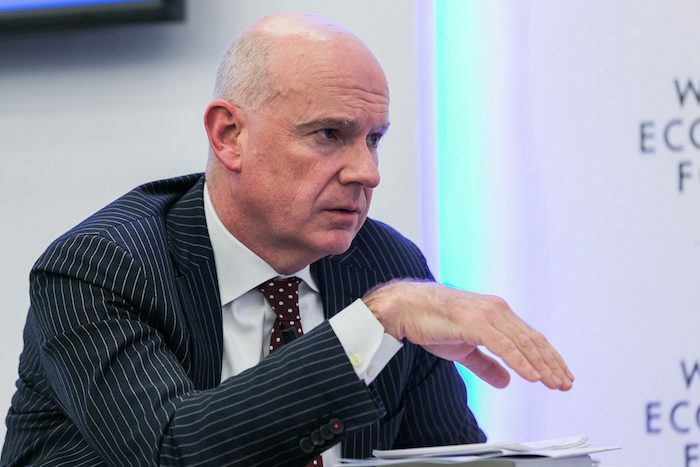 “Both driven by the need to look at how we can reduce costs and keep the paper on a sustainable economic footing, but also by taking the opportunity to produce a more cohesive and logical structure to the paper — that’s what drove us to do this,” Journal editor-in-chief Gerard Baker told me in an interview last week. As part of the restructuring, the Journal laid off the Greater New York Staff, which reportedly included at least 19 union employees. Last month, the paper also offered voluntary buyouts. Four hundred and fifty union-represented employees were offered the buyout, and 48 accepted the offer, according to the union. In our conversation, Baker and I (with a Journal spokesperson listening in) discussed the changes coming to the Journal, how the paper is trying to grow its subscriber base, and what it’s like to manage a newsroom during a period of cuts. Here’s a lightly edited and condensed version of our conversation. Joseph Lichterman: A lot of the changes were laid out in the memo you sent, but to start, I was hoping you could tell me a bit about the thinking behind the decisions you made. Gerard Baker: We’ve been thinking about the whole structure and presentation of the print paper for awhile. Obviously, we make quite a lot of changes to it over the years — adding sections, subtracting sections, consolidating, changing the names, and that kind of stuff — and we’ve been thinking that it’s time for a refresh. Obviously, I won’t pretend that this didn’t become more pressing with the decline in print advertising. You know all about that. We’ve seen that very sharp decline this year. News Corp. said the other day in its earnings report that overall advertising fell 21 percent at the Journal in this third calendar quarter — that’s our first fiscal quarter. We didn’t break out the print number, but that’s a significant overall decline in advertising. So we think that we’ve probably seen this year a significant overall decline in print advertising that is probably sustained at a new lower level. That gave additional context to our rethinking of what the print edition should be. What I wanted to do was to create a print edition that would be placed on a sustainable footing, stable financial footing in an era of significantly lower print advertising. If you look at the print edition from 15 years ago, it was much thicker. There was much more advertising in that paper. I think we all acknowledge we’re in an era where we’re not going to have that level of print advertising. I think it was right to get a print product that could be, as I say, durable and sustainable in an era of print advertising. So that led us to think about the whole way in which we present the paper. I’ve always been keen to perhaps a more coherent presentation of the various areas and various sections with in the paper. Business & Finance, we already do that on Saturday. The Business & Finance section is a consolidation of both Business & Tech coverage and financial coverage — that is, Money & Investing — which are the current two sections Monday through Friday. I always thought there was a logic to having those two sections put together. There are some savings associated with that too — there are additional costs associated with printing separate sections. Putting those two together made absolute sense to have those topics covered in one section in a more coherent way. 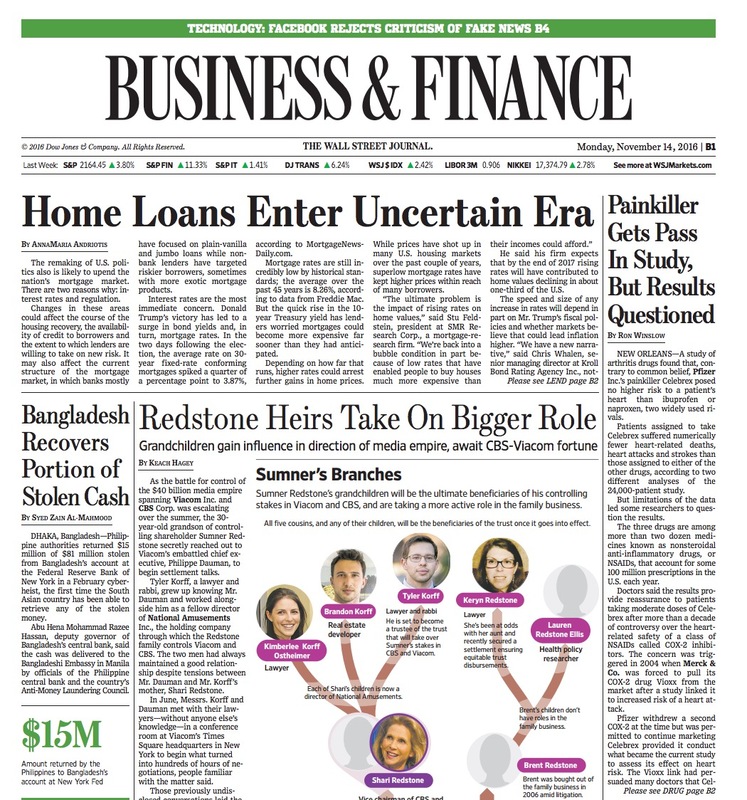 The back page of Business & Finance will be the lead page, if you like, for financial coverage, with the big market story with Heard on the Street. Inside on the back, all our financial coverage, and inside from the front, a mixture of business and financial coverage. I like the coherence of that, which brings those two together in a more naturally unified way. Then, as we looked elsewhere, we looked at Personal Journal, which appears currently three days a week as a separate section, and Arena. So, again, looking to consolidate that — looking to make savings, frankly, some cost savings. We could bring those two together and put them in a unified section that we will call Life & Art, which will be four sections Monday through Friday in the A section of the paper. Again, it makes sense for that to be within the main body of the paper. There’s a logic to having it there. That was the overall thinking, that the paper would become a more concise, sharper paper, which will be two sections three days a week — that’s Tuesday, Wednesday, Thursday — three sections on Monday and Friday. Most Mondays, there will be a Journal Reports, which is a special topics section, and then on Friday the Mansion section will be the third section. Saturdays we leave as it is — the main news section, Business & Finance, Review, and Off Duty, as well as the magazine, of course. Again, both driven by the need to look at how we can reduce costs and keep the paper on a sustainable economic footing, but also by taking the opportunity to produce a more cohesive and logical structure to the paper — that’s what drove us to do this. Lichterman: One of the interesting things I thought that you wrote in the memo was “we want to create a print edition that can a sound financial footing for the foreseeable future.” Looking at that future, do see a day where there could be further slimming down of the paper, or a day where there’s no print edition at all even? Baker: I don’t really foresee the day when there’s no print edition. I mean, who knows — we live in a rapidly changing world. Who can really say anything with conviction about what will be 10, 15, 20 years hence? But as things stand, we have a million print subscribers who really value the print edition of the paper. They really want it. They’re prepared to pay a significant amount of money for what they pay for a print newspaper. There continues to be strong demand for the print product, and we will continue to need to meet that demand. I don’t foresee any other changes in the foreseeable future. I think what we’ve done with these changes that we’re making next week is, at the same time that we’re reducing costs, we’re creating a paper that I think is absolutely more than worth the subscription costs that people pay for it. I want to keep it that way. What we’ve done is created a paper that, even at the much reduced print advertising rates that we’ve seen this year, will be sustainable for the foreseeable future. Lichterman: In a column we published last month, Ken Doctor wrote that the Journal has about 2.5 million total subscribers and 1 million digital subscribers as well. When Will Lewis became publisher and CEO in 2014, he wrote that he wanted to reach a goal of 3 million subscribers. You’re obviously not there yet, and I’ve read that’s a goal for 2017, but how are you thinking about growing the subscriber base? Baker: Just to unpick some of these numbers and just to clarify: The goal that Will Lewis laid down in 2014 was for 3 million subscribers for all Dow Jones products in three years, by the middle of 2017. That includes the Journal, Barrons, things like Financial News, which we publish in London, and some of our other products. We’re pretty well on course for that 3 million total. I think by the middle of next year, that’s the target. The number we talk about in terms of actual people individually paying more or less full subscription rates, the combined print and digital total is a little over 2 million. We’re a little over a million in digital now. Digital hit the million mark and is poised to overtake print for the first time this year. We’re pleased with that. We’ve made great progress on digital. Print is down a little bit, not dramatically, but a little bit. Our expectation is that our total Journal circulation will be closing in on two and a half million over the next couple of years, and we think that’s a very reasonable goal driven by digital circulation growth. Lichterman: The Journal recently released its WSJ2020 plan, and it seems that digital — and mobile — will be a significant part of that. I’m curious about how digital, and mobile in particular, fit into that process. Baker: Mobile, this is where we’ve put most of our efforts in the past few years in terms of transforming the newsroom and in terms of transforming the whole company to become more digital and, particularly, more mobile. We’ve made big changes in the newsroom: training journalists, first of all, to be more digital, changing the way we work, changing the way the desks work here, changing our publishing schedule so that we publish stories during the day digitally at a time when readers are engaged most.Many more things like that we’ve done to make us more digital and increasingly mobile. We’ve introduced more visuals, made sure that the presentation of all our journalism is optimized for mobile devices. That’s clearly where all the growth is coming from. Digital circulation growth is up substantially, and we think it will continue to grow. Again, much of our effort is on making sure that mobile, where most of those people are going to be coming from, that that experience is absolutely optimal. What Will announced a couple weeks ago, and I’ve followed up on in the newsroom, is this project 2020, which is largely designed with that in mind. It’s a project to look at all our operations across the company, the three main areas of our company. Particularly, for me in the newsroom, it’s to look at our operations here and how we can become more efficient digitally, how we can become more attuned to mobile needs, looking hard at our cost base and areas where we can make some savings. But at the same time, also, looking at those areas that we know are producing growth in terms of circulation for the paper and doubling down on those areas and investing there. The overall answer is that we are very focused on digital growth, on improving the mobile experience, and making sure we are maximizing the available resources in those areas that are going to produce mobile and digital growth and making savings across the newsroom to improve the overall efficiency. Lichterman: What are some of those areas, digitally and on mobile, that are producing growth, and how are you looking to grow those? 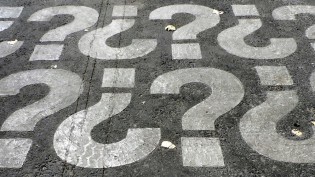 What might we expect to see moving forward? Baker: We are focused really hard on circulation growth. That’s not to say that we don’t want advertising — we want advertising. We’ve got a robust digital advertising base, and we think that’s going to grow over the next few years. Again, for the long-term future of the paper, we’ve staked our strategy for the paper — by the paper I mean the paper in the broadest sense of the term, The Wall Street Journal, including digital — on growth in digital circulation. For us, it’s all about circulation. So, what we’re doing, one of the beauties of the digital age, is that we have much more data available to us. We know, minute by minute, where the readers are, what they’re reading, how much engagement there is, how long they’re with stories. The Journal is a subscription-based newspaper, so to read most of the content beyond the very simple stuff you get on Google and whatnot, you have to subscribe. We put the vast bulk of our journalism now behind the paywall — including, obviously, our best enterprise journalism. What we’re able to do is we’re able to trace each day the stories and types of stories that generate subscribers, that turn people in from just being people who casually come to the site for a story and then choose to subscribe by actually signing up. We look at that everyday and we get a strong indication from that as to what are the kinds of coverage that are driving subscriptions. That tends to be enterprise journalism in core areas of business, economics, national politics, big policy and political stories. What we’re doing in the newsroom is matching the resources that we have in a 1,500-journalist newsroom to those areas that we know from the data that are going to be the best, most promising areas of circulation growth. Again, it’s business, finance, markets, technologies. It’s not to say we ignore other stories. We don’t at all. We obviously have robust coverage of general news; we have great culture, life, entertainment, arts, and sports coverage. But you know that’s not going to be where the opportunity for us to drive circulation growth. That will always be part of the package that’s available to subscribers, but it will be the core stuff — business, finance, and economics — that will drive circulation and that’s what we’re really focused on in terms of producing the best journalism. Lichterman: Do you think that subscriber revenue can make up the difference in lost advertising revenue? Baker: The numbers are fluid, right? Our circulation revenue is growing. It’s growing well. It’s growing robustly. I think that can absolutely continue. Advertising, it’s no secret, is down this year. Overall, it’s been steadily declining for some time. The overall answer is yes. Exactly over what time frame this will occur, I don’t know. You have to adjust according to the way these numbers do flow back and forth. But I’m confident that the answer is yes. That’s not to say there won’t be advertising — I’m confident that we will always have significant advertising revenue, but I am also confident in the combination of that advertising revenue and the growth of revenue that we’re going to get from circulation. The other thing I should talk about, which is our very important, is that we have professional products: Dow Jones newswires, we have WSJ Pro, which is a suite of products which are highly specialized news products for professionals. I think that we have a unique opportunity as the Journal to produce more of these, to produce more professional products, which are much smaller circulation than The Wall Street Journal, but people pay a very high premium for very high quality, very specialized information. That’s a huge source of potential revenue for us now and a huge source of potential revenue growth. That all counts, obviously, in the general sense of subscription growth — people paying for the quality information and news that we provide. I think all of that together — Journal circulation growth, the growth of professional products, the growth in professional news and information we can provide — I’m confident that that will make up for the declines that we’ve seen in advertising and actually will enable us to grow significantly as a business because we’ll have that durable sustainable circulation revenue as well as having whatever advertising revenue we have. Lichterman: Digital circulation is key to your strategy. That thinking, I imagine, is behind how you’re thinking about platforms such as Facebook and Snapchat Discover. How do you balance publishing on those platforms versus publishing on your own platforms? Baker: Yeah, exactly. All news organizations are grappling with that. We’ve taken a very different approach from, say — the most extreme example would be, The Washington Post, which more or less publishes everything on Facebook. We know how much traffic comes to us from Facebook, we know how important Facebook is, we welcome that, but what we want Facebook to do is to be a channel for us to increase subscriptions to the Journal. We’re not going to make more than a very small amount of our journalism available to readers on Facebook or other channels for free. We’re going to work with Facebook and Facebook has worked with us. That’s a little bit different than with Snapchat Discover, which obviously is not a subscription channel at the moment. It’s free. That’s supported by advertising. We’ve had great traffic numbers, I should say, on Snapchat. Facebook is very important for us, but important for driving circulation rather than just driving traffic. Lichterman: You mentioned earlier that in addition to looking for areas for growth, you’re looking for cost saving measures. What are you looking for on that front? Baker: There’s a couple of different ways. What we talked about with print, these changes next week will reduce some costs in print costs and some headcount reductions which we’ve achieved. That’s the first way. Secondly, this 2020 review will look across the whole newsroom around the world — just to emphasize, we have almost 1,500 journalists around the world — and look for opportunities there to improve our efficiency, some of which will doubtless result in some savings. Again, we’ll want to allocate resources to those areas where we think we can be doing more, but there will be areas where we’ll look and we’ll think, well, we can introduce some efficiencies into this process, and there will be some savings to be had there too. Those are the two main areas that we’re looking at. I think we’re much more sensitive as a newsroom and mindful of the cost constraints that we have but also where the opportunities are. We’re constantly looking to reduce costs as far as we can in areas that perhaps are not core to our longterm growth and at the same time to increase resources and increase investment in areas that we know are crucial to that growth. Lichterman: Are there particular areas that you think are not crucial to the longterm growth of the paper? Baker: The areas, again — just going back to what I said about what drives digital circulation. We know from the data that the core areas for us, the areas that most distinguish the Journal from any other newspaper are business, finance, economics, policy — broad, big political issues, political trends. Opinion is very important for us, but as you know, I’m not responsible for the opinion pages. They operate completely independently from the newsroom, but that’s an important driver of circulation. Those areas are the core areas. That’s not to say we’re not going to get out of the other areas that we do. We’re making these changes to Personal Journal, Arena, Greater New York. But we’re not eliminating any of that coverage. We’re continuing that coverage. Rebranding some of it, and focusing more of it on digital. It’s still going to be an important part of the package, but we’re going to focus on those areas of growth, which are the core areas of coverage. Within that, we can make some efficiency savings in the way in which we operate, which doesn’t necessarily mean getting out of the areas of coverage, but it means we can make savings in some of our editing procedures or in or some of our other operations. Lichterman: You’ve mentioned that mobile is where the growth is going to come from. I’m curious what do you make of the Journal’s current product offerings on mobile and whether we might see any new products to grow that subscriber base or through a different product offering? Baker: First of all, on the main mobile offering, which is mobile web and the main WSJ app, we’re constantly working to improve the digital experience there, whether it’s making the pages load faster, which we’ve done in the past few months, whether it is improving the customer experience, all of that continues. That’s an ongoing process where we’ll continue to improve the graphics, improve the way video performs, and all of that. Those core mobile experiences — app and mobile web — are going to be where we are going to focus most of our efforts. Over the course of the past couple of years, we have launched separate apps: the What’s News app, which is a brief summary of the major news stories in a special app format, and WSJ City, which is aimed at readers and users in London, principally, since London is such a big financial market. We’ve launched those in the past couple of years and we’ve been pleased with how they performed, and we continue to look at them and to see how they fit into the overall product range of what we do. Whether we need to continue to offer a range of apps or whether we should focus more on the core apps and the core mobile experience, that’s something we’re constantly reviewing, but we haven’t made any decisions about that yet. But, look, my emphasis is very much about improving the Wall Street Journal app, improving the Wall Street Journal web experience, and we can always do these other apps. Other news organizations have tried them too, which may be a helpful way to generate more traffic or subscribers or whatever, but for us the main emphasis is on the comprehensive Wall Street Journal mobile experience. Lichterman: It’s been reported, and we’ve discussed a bit, that there have been some headcount reductions, and I’m curious what your approach is to managing a newsroom that’s going through reductions like this. How do you think think about it to try and keep morale up? Baker: The core thing is to keep people focused on the job, which is produce the best journalism. There are lots of distractions, as you say, and sadly you do go through periods when you do lose people. We’ve just been through this big voluntary buyout exercise. A significant number of people have signed up to take voluntary buyouts. We’re going through this review process, we’re making changes, and it is difficult. But what most motivates people and what most improves morale is the sense that we’re doing the best journalism, unrivaled journalism. I try as hard as I can to keep the focus on that and to show that, whether in mobile, other digital platforms, or in print, we are doing the best around. This week is a good example. Our coverage of the election on Tuesday night was outstanding, and reminding people of what we’re doing, how well we’re doing it, motivating them to do even better there, whether it’s big stories like the election, the markets, big corporate events, big investigations that we do. That’s what motivates people. When they really see our coverage of these events, when we break news, or do big investigations, it makes The Wall Street Journal indispensable. That’s what gives them, I think, the excitement to come to work every morning and to work for The Wall Street Journal. They’re all really smart people. We’re a business news publication. Nobody is ignorant of the pressures that are on our business. They realize that. They see what’s happening to advertising. They know the digital world is transforming the way we work and putting additional pressure on the way we work. They’re all grownups, they’re all sensible, and they understand that. They understand that we need to make these changes like the one we are now. I think, above all else, giving people a reason to really, passionately believe in what we do — journalism that’s accurate, reliable, and trustworthy — that’s the best way to keep people happy. I have to say, I’ve been a journalist for more than 30 years. I’ve worked in five different news organizations. The passion the staff here have for the Journal and what we do is not found anywhere else. We have the most committed, passionate, engaged journalists. They love what they do, they love the Journal, and they have a great, great dedication to it. I find that very inspiring. What I’ve got to do is make sure that the journalism we’re doing keeps them believing in that journalism and keeps them committed to it. Photo of Gerard Baker by World Economic Forum/Benedikt von Loebell used under a Creative Commons license. POSTED Nov. 14, 2016, 6 a.m.
Lichterman, Joseph. "Why The Wall Street Journal is cutting print sections and refocusing on its core coverage." Nieman Journalism Lab. Nieman Foundation for Journalism at Harvard, 14 Nov. 2016. Web. 23 Apr. 2019. Lichterman, Joseph. "Why The Wall Street Journal is cutting print sections and refocusing on its core coverage." Nieman Journalism Lab. Last modified November 14, 2016. Accessed April 23, 2019. https://www.niemanlab.org/2016/11/why-the-wall-street-journal-is-cutting-print-sections-and-refocusing-on-its-core-coverage/.